We’re taking on restoration of an important house in New Albany with plans to make it the new home of our Southern Regional Office. Even before a fire earlier this year left it in perilous condition, the Hartman House in New Albany had been on our radar since it was vacated in 2012. Today, the 100 block of West Chestnut Street in downtown Jeffersonville looks a lot different than it did 34 years ago. Back then, the Grisamore House, a double home built in 1837 by two brothers from Philadelphia, had been heavily damaged by fire. It was a deteriorating eyesore surrounded by vacant lots. Preservation advocates know that transforming a significant property can serve as a revitalization catalyst in devalued areas. Jeff-Clark Preservation and Indiana Landmarks partnered to restore the Grisamore House in 1983, installing our new Southern Regional Office there. Now Indiana Landmarks is preparing to do the same thing in a new community. Restoration of the Grisamore House in the 1980s launched revitalization of a key area in downtown Jeffersonville. Restoration of the Grisamore House was just the beginning of our work on West Chestnut Street. We also established Glossbrenner Garden and relocated two endangered historic homes to previously vacant lots, including the 1890s Willey-Allhands House, home of our southern office since 2004. All together, those projects add up to more than $600,000 of investment that helped spur additional downtown revitalization. Today, the 100 block of West Chestnut is a vibrant avenue of offices and restaurants serving as a gateway to Indiana from the Big Four Pedestrian Bridge linking Louisville, KY and southern Indiana. The time is right to move to an area that needs our help. 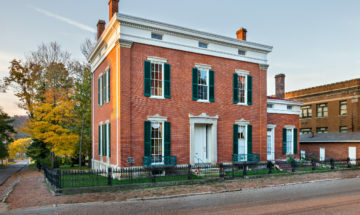 In August, Indiana Landmarks announced that will move our Southern Regional Office to a historic house in jeopardy in New Albany. We’ll soon begin work on the Louis Hartman House, a large Queen Anne-style home on one of the city’s most heavily traveled thoroughfares. Even before a fire earlier this year left it in perilous condition, the house at 911 State Street had been on our radar since it was vacated in 2012. 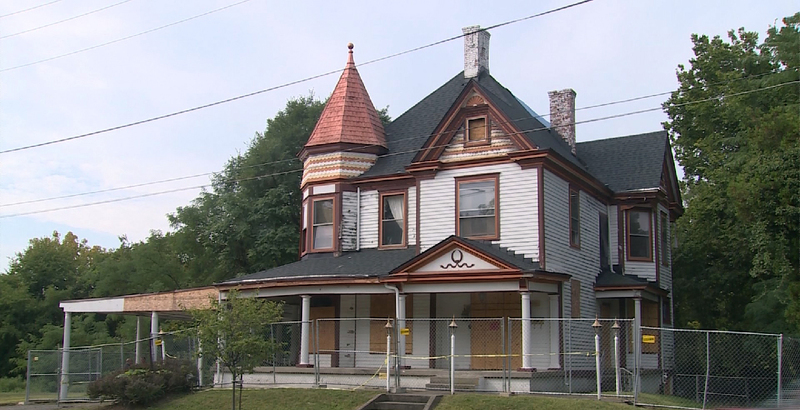 “The rehabilitation of this house will be a highly visible project that we hope will be as transformative for this area in New Albany as our previous restorations were for Spring Street in Jeffersonville. 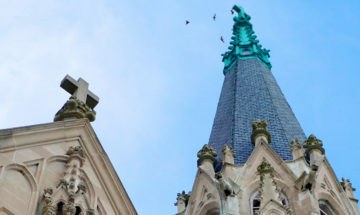 The house is the first prominent residence encountered as you travel north on State Street from the downtown core,” says Greg Sekula, director of Indiana Landmarks Southern Regional Office. “State Street is a major gateway to downtown New Albany and links the core of the city to its hospital and outlying shopping districts,” he adds. Louis Hartman, a German immigrant, became one of New Albany’s most prominent businessmen in the late nineteenth century, involved in railroads, schools, and the local meat-packing and flour milling industries. Influenced by his immigrant status and Christian upbringing, he showed notable generosity toward Africans Americans who struggled economically and socially in the post-Reconstruction era. Local tradition and newspaper obituary accounts at his death maintain that Hartman advocated for African Americans throughout his life. 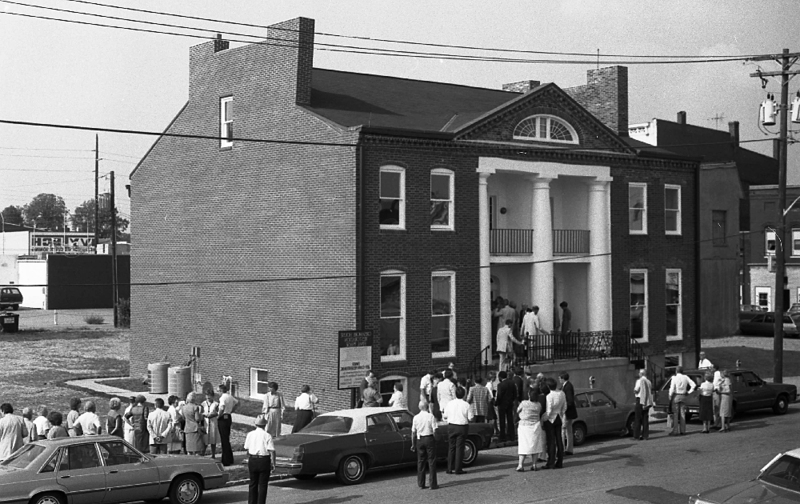 The State Street property later served as an African American funeral home for more than 40 years. 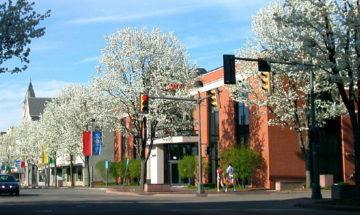 Indiana’s Historic Pathways, a designated National Scenic Byway, follows State Street past the Hartman House, and New Albany has identified the district as a priority area for investment and revitalization. We’re rescuing the Hartman House with financial support from the Horseshoe Foundation of Floyd County, the City of New Albany and its Redevelopment Commission, The Paul Ogle Foundation, and individual donors. Architect Ron Stiller of RCS+ Associates, Floyds Knobs, Indiana, project architect for the restoration, which we estimate will take 8-12 months. For more information, contact Sekula in our Southern Regional Office, 812-284-4534, gsekula@indianalandmarks.org.